The foregoing background is reprinted from my review of the first two volumes. These two very handsome reprint collections present the third and fourth Endtown story arcs. Volume 3 has the complete story arc ‘The Ballad of Holly and Wally’ (January 17 to November 18, 2011. Volume 4 contains ‘Countdown’ (November 21, 2011 to October 24, 2012). Volumes 1 and 2 are a complete story in two volumes. 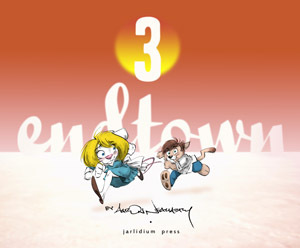 Volume 3 introduces the cat-man Wally Wallechinsky and his mouse girlfriend, Holly Hollister, and expands what we know about the supporting denizens of the underground Endtown. When Wally is first seen, he is a Topside drifter, wallowing in self-pity about how he used to be a man and is now half-cat, but is not ready to commit suicide by letting the 100% human Topsiders in their hermetically-sealed biosuits catch him. Wally is rescued and recruited for Endtown against his will by Allie Alvarez, a half-alligator woman. When Wally is mugged and left for dead, he is saved by Holly Hollister, a mouse waitress who gradually brings him out of his depression, convinces him to accept his new life, and helps him in a sting operation to find his mugger. This is the first half of Volume 3. In the last half, the Endtown leaders discover that the Topsiders are preparing to launch a rocket that threatens Endtown’s existence. Captain Philomena Flask (cat-woman), the head of Endtown Security, drafts Wally into a mission Topside to destroy the rocket. Holly stows away to join them, and the two learn that the sadistic Flask has a secret agenda that may annihilate both communities. This volume ends in mid-story. Volume 4 has the conclusion of the Topsider mission, introduces Aaron Marx, a mysterious human with apparent godlike powers in a flying boat, and has the countdown to the end of “Blackie” Flask’s story. Volumes 3 and 4 should be read as a two-part set. 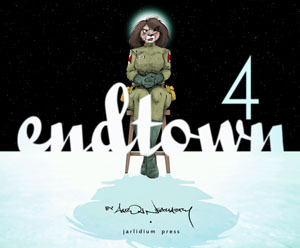 Endtown is somber rather than funny or action-oriented. The Endtowners go about their lives trying to maintain their human culture despite their new bodies and instincts. The missions Topside have an air of desperation. An intriguing subplot involves Jacob Jackrabbit and his animal-man supremacy league. He demands that all Endtowners take new last names to show their pride in their new species. Anyone who keeps his or her old pre-mutant name is an enemy. More will be seen of him later. As Holly says, life goes on. 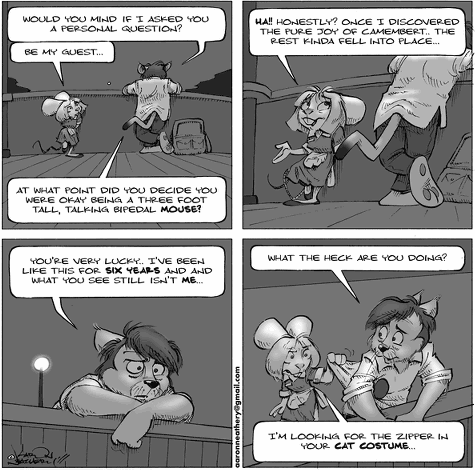 This is a strip that every Furry fan should be reading on the Internet. And for those who do not want to have to click through its archive for hours, here are the paper collections. WILL I EVER BE ABLE TO GET THEM VIA AMAZON? We are committed to making these strips available in print; we just have to work with Aaron and shop around for printers to find a format that looks good and doesn't drive the cover price through the roof. Volumes 1 and 2 are also affected by the cost increase and we will find a solution for them as well. This process will take some time, but we hope to have the retail editions of all volumes out in the Fall. Jarlidium Press will also be at RainFurrest in September. If you can’t be at RainFurrest and you don’t want to wait for them to find a cheaper printer, contact Jarlidium Press directly about buying copies. Endtown starts out silly, but quickly becomes far more meaningful. Some characters you'll sympathize with, others you'll love to hate. At times, the comic appears a little too self-conscious, but these moments pass quickly. Worth reading.